[I] The Epistles of John (Part #1) starts our exposition into the letters of John by examining “that which was from the beginning” or the Word. This 40 minute sermon also teaches five conditions of genuine fellowship and the importance of confession for forgiveness of sins. John the revelator persistently taught that Jesus Christ is Yahweh thus this introductory segment teaches no different. [II] The Epistles of John (Part #2) is a 40 minute sermon instructing Christians in maintaining fellowship and sinless living. This continuing segment confirms that all who profess to know Christ must also “walk as He walked” (or follow the eternal Laws of God). John's messages contain several keys on how to overcome Satan or “the wicked one” and these are only partially explored here. [III] The Epistles of John (Part #3) continues our exposition by teaching Christians not to love the things of this world but rather to remain unified through Jesus. This 40 minute sermon also explains how to obtain the gift of "spiritual anointing" (or the Holy Spirit) and defines what antichrist(s) are. Yahweh's love allows the lawful to be called “the sons of God” so this segment clarifies why. [IV] The Epistles of John (Part #4) lectures about the effect of divine love and the purity (through sinlessness) that all Christians must seek to obtain. This 40 minute "seedline" sermon proves that we must love our racial brethren because John compares those who don't to Cain who “was [born] of that wicked one” meaning Satan. Learn to identify legitimate Christian suffering by listening! [VI] The Epistles of John (Part #6) deals almost exclusively with the topic of love. In this sermon we learn how to "prove" we live for Yahweh and the true nature of love is found within the Messiah. By listening to this 40 minute segment you'll also be able to understand the doctrine of "new birth" (or being born again) and five Biblical “witnesses” that eternal life is only found in Jesus Christ. [VII] The Epistles of John (Part #7) further substantiates that eternal life can only be found in the Messiah who answers every prayer aligning with His eternal Word. This 40 minute episode begins to explain John's second letter by establishing He was an "elder" who taught Christians must prove their love to Yahweh by “walking in the commandments” or following "the Way" which is Christ. [VIII] The Epistles of John (Part #8) concludes our series on John's epistles with admonitions to walk in Yahweh's Law and warnings against deceivers or antichrist(s). This 40 minute sermon warns against backsliding and how to handle false teachers who refuse to recognize Jesus as Messiah. 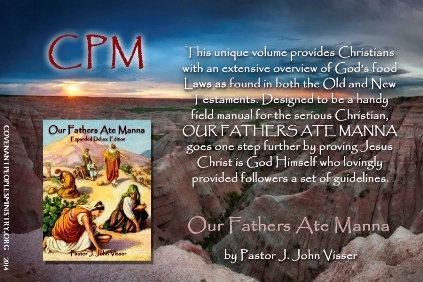 This finishing segment also features a concise overview of upcoming books and audio sermons by CPM. No Greater Joy covers both the second and third epistles of John (in their entirety) to establish what an "antichrist" truly is. By studying these two letters to the churches Christians are better able to spot the deceivers that work against the genuine teachings of Christ as transcribed in His Word. This energetic sermon exposes the devil's iniquitous seed and further answers the question "What is faith?" The Spirit Is Truth! reexamines the first letter of John 5:1-9 to establish that Yahweh's Law is not only applicable for today's sickened society but the very answer to many of Israel's current tribulations. This cheery sermon discusses the scriptural reality of the "trinity" in order to instruct Christian Identists on how to overcome their daily obstacles through faith in God's unchanging (and eternal) Word. According To His Will returns to the text of I John 5:10-21 to prove that anything genuine Christians ask of Yahweh must be in accordance with His moral Law. The apostle John makes a solemn warning against idol worship in this chapter thus further explanation of "graven images" is provided. This sermon shows the value of knowing Christ in obtaining eternal life with Yahweh in His Kingdom. Celts & Kikes Downunder allows Obadiah 1:18 to explain the Christian roots of Australia and its similarities to the establishment of America. Thought you knew everything about the Great Southern Land? Think again! Towards the conclusion of this Godcast Pastor Visser preaches from 1st John 3:1-8 providing listeners with the Biblical definition of "sin" and exposing the sons of Yahweh in the process. No God Speed focuses solely on II John 1:6-13 to prove that Christians show their love towards Yahweh through obedience to scripture. More importantly this short sermon proves that Christians are NOT to allow those who worship lowercase "gods" within their homes and doing so risks curses from Yahweh. During the intermission enjoy several audio clips from other talking heads about Obie & Viss. Greater He In You scrutinizes 1st John 4 to show that Bible study alone is not sufficient to overcome false teachers - it requires discernment of the imparted Holy Spirit. Scripturally, both the sons of Yahweh and offspring of the serpent are literal thus loving John provides several ways of understanding who is genuine in addition to substantiating the importance of God's Law (as opposed to dismissal of His morality). A Study On Antichrist examines every usage of the word ANTICHRIST all found in loving John's epistles and proves all Christ-deniers are considered "not of Yahweh" and should be marked. Who or what is an antichrist? Is it the Son of Perdition? A deeper look at the Greek word antee-khristos helps expose four distinguishing characteristics of the numerous antichrists posing as teachers of God's Word. Born of Yahweh probes deeper into the fifth chapter of John's epistle to define the doctrine of Yahshua. The apostle John describes antichrist as "those who deny Christ" but what about those Israelites that accept Him? How can we identify these sons of Yahweh? This brief sermon explains eight guarantees of being a Christian from John's first letter and proves Satan can't move against those YHVH protects. 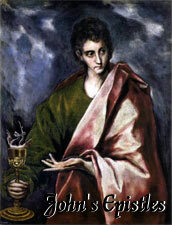 Second Epistle of John covers the apostle's entire letter and explains what the word "antichrist" means. This missive written to the "elect lady" warns future believers of many deceivers and antichrists that refuse to abide in the doctrine of Christ. Loving John not only taught that the faithful show their love to Yahweh by loving one another but also commands we refuse hospitality to those who twist scripture. Third Epistle of John begins by providing a brief background on the disciple John's conversion from a "son of thunder" into the "apostle of love" before covering his entire third letter. Veiled within this sermon is an explanation of the recent CPM Notice and a comparison of genuine brothers in Christ to false ministers. John's main focus in old age was truth and love therefore this program explains CPM's future. Abide in Christ compares Ist John 2:26-28 to Ist Corinthians 2:9-16 to prove both John and Paul taught the faithful must have the mind of Jesus Christ. This relaxed sermon regarding the anointing of the Holy Spirit and righteous judgment is designed to strengthen our Christian walks by explaining "he that is spiritual judges all things ( especially "seducing" ministers ) yet he himself is judged of no worldly man." What Manner of Love! uses the structure of Ist John 3:1-15 to prove the importance of brotherly love. The apostle John says "whoever hates his brother is a murderer and has no eternal life" making this racial investigation into abiding within Christ imperative to the Christian walk. It is the very act of love that differentiates and defines Yahweh's children on earth allowing the Saints to recognize one another. Bible Doctrine of Sin begins by defining iniquity as "Everyone who commits sin also breaks the law because sin is the breaking of law (I John 3:4)" before teaching on the means, purpose, immutability, obligation, requirements, basis and extent of Yahweh's Law. This legalistic episode of The Covenant Gathering proves only obedient Israelites will ultimately be permitted entrance into Yahweh's imminent Kingdom. Believe Not Every Spirit examines I John 4:1-16 to confirm that only through Christian discernment can the faithful recognize the Holy Spirit from the spirit of error. Is everyone that claims to accept Christ worthy of devotion? What is love scripturally? This relaxed sermon inspects the term "antichrist" and establishes when Satan speaks his lies the world accepts them as truth from John 8:44 and other epistles. New Testament Warnings looks at eighteen specific admonitions from the Bible and quizzes the listener on their scriptural familiarity. This Covenant Gathering broadcast uses only "new covenant" epistles to show the condition of Christ denying us, being cast into the lake of fire, knowing antichrist(s) and additional apostolic tenants while aiding the faithful in spotting false prophets in Christian Identity. Walk in Truth covers the third epistle of John by comparing the corrupted works of Diotrephes to Demetrius' good report. Who would withstand the loving disciple John? Many during the first generation church! Also explained is the apostle John's commandment to "follow not that which is evil but that which is good" and why abstaining from all appearance of evil is essential to successfully please our Father. Born of the Bride is a unique Covenant Gathering broadcast that breathes new life into three lesser-known CPM shorts; "Monogamy and Bride of Christ" (2005), "Truth Shall Be Evil" (2015) and "Born of Yahweh" (2016). As a single study featuring new introductions by Pastor Visser these three mini-sermons on the epistles of Peter and John now work in unison to prove the longevity of Yahweh's everlasting Word.